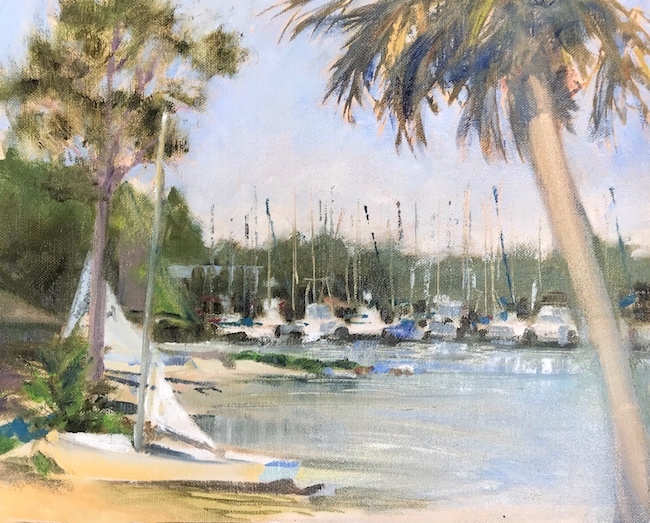 As the volunteer coordinator of the Emerald Coast Plein Air Painters, Joan Vienot has her hands full, choosing sites across Okaloosa and Walton County where the group can meet to paint en plein air every Wednesday morning. Joan swears by the practice of plein air painting, finding that it has helped her to improve herself as a painter in every way, from composition, to mixing colors correctly, to capturing light and feeling, to professionally presenting her work. Selling her pool service business two years ago, Joan counts May 1 of this year as the date she can say she became a full-time artist, finally no longer required to consult or serve as contractor for the business she had owned. She says that her studio work is lightyears ahead of where it would be if she had not been practicing en plein air the whole while. Each Sunday evening finds Joan emailing more than 450 “members” to advise of the next Wednesday’s painting location and other news of interest to plein air painters. Usually anywhere from 3 to 15 painters show up. To join the email list, write to Joan@ECPleinAir.com. Joan laughs that she herself received the invitations for 8 years before she started coming! To see photos of the painters and paintings, visit www.Facebook.com/EmeraldCoastPleinAirPainters.